Merry Christmas to all of you!! This holiday season we wish for your happiness and hope you enjoy an amazing time alongside your family and friends. And we here also want to make your life this festive season filled with joy and incredible lifetime moments. 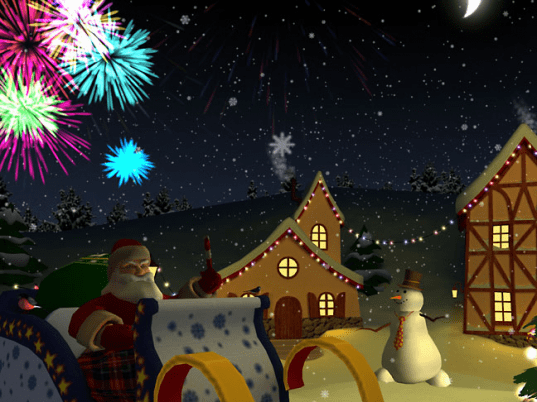 To make your life merrier we want you to have the Christmas Holiday 3D Screensaver 1.02 installed in your computer. Just like a d袯r item let this screensaver float on your monitor and relish the beauty of it which will bring the entire holiday feeling in and around of the region where ever you have kept your computer system. You can keep this screensaver for this whole season in your system both at your home or in the office in case you are not getting an off this holiday. Christmas Holiday 3D Screensaver is a three dimensional animated program that is bound to lighten up your heart in every possible way. In the screensaver you can view a wintery landscape with few houses that are decorated for the eve of Christmas. Besides the houses the area surrounding is also garlanded with colorful lights, ornamented Christmas tree and snow clown. A Santa Claus riding on its sledge is beautifully placed in the area that is going to distribute the gifts to all the houses located around. Far away in the sky fire crackers are making the whole scenario bright and even more colorful. Majestic 3D graphical art is being crafted to bring out a lovely scenario that proffers the lovely sense of holiday in you. The falling snow with the light and blissful music that rings in the background makes the Christmas even stunning. After putting on the screensaver we found its fantastic credibility in terms of Photo-realistic 3D graphics, Christmas Music theme, password protection, digital clock really cool. As a result we feel 3 stars are well suited for it.